GA State Rep. Tommy Benton should Just. Stop. Talking. No, your eyes aren’t deceiving you. That’s an elected official defending the KKK in the year 2016. According to Benton, the Klan “was not so much a racist thing but a vigilante thing to keep law and order.” And to promote the wearing of festive, pointy-headed costumes, one might add. Benton’s views are why for years he has pushed legislation that would protect the state’s historical monuments from being marred or moved. This year he is stepping up his efforts with two newly introduced measures, one of which seeks to amend the state constitution to permanently protect the carving of Confederate President Jefferson Davis and Gens. Robert E. Lee and Stonewall Jackson at Stone Mountain. Aaaannnnnddd this is one reason why it’s hard for conscientious preservationists who prefer to leave historic monuments in their original context to make their case. There are plenty of folks out there who have no desire to endorse or perpetuate the sentiments these monuments’ creators wanted to express; they just want to leave historic landscapes intact so that we can interpret them as we would a historic home or an artifact. But with yahoos like Benton running their mouths, it’s easy to assume that the only folks who oppose removing Confederate monuments are racist ignoramuses. The best thing Rep. Benton could do for historic preservation would be to put as much daylight between himself and other preservationists as possible. Oh, and he doesn’t think the Civil War was about slavery, because of course he doesn’t. Benton, a retired middle school history teacher, equates Confederate leaders with the American revolutionaries of the 18th century — fighting a tyrannical government for political independence. “The war was not fought over slavery,” he said. Those who disagree “can believe what they want to,” he said. He used to teach middle school history, and now he’s a legislator. You decide which is more disturbing; I’ll be slamming my forehead against a desk somewhere. If you haven’t seen the special exhibit of Lloyd Branson’s art at the East Tennessee Historical Society yet, I highly recommend it. I’ve been twice, mostly to get a closer look at Branson’s masterpiece: his painting of the muster at Sycamore Shoals, on loan from the Tennessee State Museum. I’ve seen it before, of course—so have you, if you’ve ever taken a look at my blog’s header—but always in the King’s Mountain exhibit case at the State Museum. Without that protective glass and dim lighting, it’s like looking at a whole new canvas. The colors are much more vivid, and you start to pick out details you’ve always missed. It’s sort of like the first time you watch something in HD. For example, here’s a group of militiamen gathered around a fire. Looks like the guy on the far right is wearing a brown frock and leggings. A little white dog appears to have followed his master to the muster ground. The guy in the blue coat is checking his horse’s feet—not a bad idea, considering he’s got a trip of something like 200 miles ahead of him. One soldier with a blanket roll hurries to catch up with his comrades. In the foreground, a volunteer kisses his wife or sweetheart goodbye, maybe for the last time. I’d never noticed this African American before; he’s on the left-hand side of the painting, near the bank of the Watauga River. The force that attacked Ferguson did include some black men. Lyman Draper reports that Col. William Campbell’s mixed-race slave John Broddy was along for the march. Another black King’s Mountain vet was Ishmael Titus, who was born a slave in Virginia and earned his freedom by serving as a substitute for his North Carolina master. Here’s something else I’d always missed when looking at printed images of the painting: Branson put a couple of Native Americans at the muster. Just a few months after the scene depicted here, the settlers in present-day Tennessee would be at war with their Indian neighbors again, and John Sevier would be leading his men south into the mountains on another campaign. Is that a road running along the riverbank? Perhaps it’s the trail that will take the Overmountain Men toward their camp at Shelving Rock. There’s a fire going in one of the cabins nearby, and it looks like somebody’s cultivating the fields by the river. More horses are lined up and ready for the long ride that will end in South Carolina. Not all the Overmountain Men were mounted. Here a group of footmen head out with rifles, blanket rolls, powder horns, and cartridge pouches. As big and busy as this scene is, the amount of detail that Branson put into these small figures is remarkable. There are two prominent men on horseback in the foreground, shaking hands with well-wishers before setting off. If I recall correctly—and I don’t remember where I read this, so it’s a rather big “if”—the one on the left is supposed to be Isaac Shelby, and Sevier’s the one on the right. Don’t quote me on that, though. Even more mounted volunteers head out from a fortified building (Ft. Watauga, perhaps?). In the distance are the Appalachian mountains, the same ones Ferguson has threatened to march over to lay waste to the settlements. The riflemen beside the river will be crossing those hills instead, headed in the other direction to take out Ferguson and his Tories. The more time you spend with the painting, and the closer and more carefully you look, the more you start to pick out finer details, and at some point all those seemingly indistinct figures start to take on a life of their own. It’s not unlike the process of studying history, come to think of it. It’s nice to see The Revenant getting some attention during movie awards season. Although it takes quite a few liberties with the Hugh Glass story, it’s a well-made film and a powerful depiction of the hardships and dangers endured by the nineteenth-century fur traders. One of the things that struck me about the movie is the way its two main characters reflect contrasting frontier archetypes, set apart by their interactions with the West’s original inhabitants. These archetypes appear and again over the course of the American frontier’s history, from the colonial era through the late nineteenth century. For some people, the frontier was a liminal realm where cultural and racial barriers broke down and where a degree of mutual accommodation and hybridity was possible. Moving and living among Indians, these traders, trappers, and missionaries straddled the border between the worlds in which they were born and the ones they inhabited. Examples of this type would include the coureurs de bois of New France, who sometimes too up residence among Indians, learned their languages, adopted their dress and customs, and married into their societies. Another would be Simon Girty, who assimilated into Indian culture and fought with Britain’s Native allies in the American Revolution. In the film, Hugh Glass (the title character played by Leonardo DiCaprio) comes across as this type of frontiersman. Formerly married to an Indian woman, he has a mixed-race son and is himself bilingual, as fluent in the language of the Indians he encounters as he is in English. The film’s Glass thus represents a particular frontier archetype: the white man for whom cultural and ethnic barriers are permeable. Richard Slotkin has referred to the archetypal “man who knows Indians” in frontier literature. This figure is often a warrior; he uses his familiarity with Indians to defeat them on their own terms, demonstrating his own superiority in the process. The Revenant‘s take is a little different. While Glass has violent encounters with Indians, the point of his ordeal is not so much that he survives by killing Native foes, but rather the fact of his survival itself. Indeed, his ability to communicate and interact with Indians on something like an equal footing plays an important role in his survival. If some historians have portrayed the frontier as a zone of adaptation and exchange, other scholars have portrayed it as a realm prone to explosions of bloody conflict. From this perspective, the frontier was not a place where cultures overlapped and blended, but a place where they collided and ground against each other like tectonic plates. For many frontier whites, familiarity with Indians bred contempt rather than accommodation. They had no use for Natives, nor for the easterners who stood in the way of extirpating them. The work of Peter Silver, David Andrew Nichols, Patrick Griffin, Brendan Lindsey, and Ned Blackhawk reminds us how prevalent this “Indianophobia” could become. Historical representatives of the Indian-hating westerner would be men such as the Paxton Boys or the perpetrators of the slaughter of peaceful Christian Indians at Gnadenhutten. An individual example would be John Kirk, Jr., who murdered a group of Cherokees under a flag of truce to avenge the massacre of his own family at Indian hands in East Tennessee during the 1780s. In The Revenant, the treacherous John Fitzgerald (played to chilling effect by Tom Hardy) is the archetypal Indian-hating frontiersman. He is suspicious of Glass for his past residence with the Pawnees, and is openly contemptuous of the son Glass fathered with an Indian wife. Perhaps Fitzgerald’s hatred for Indians is as personal as Kirk’s, since the kerchief he wears on his head covers the scars of a scalping he survived and can still vividly recall. I don’t know if the filmmakers intended Glass and Fitzgerald to stand in for these two contrasting types of frontiersman, the cultural hybrid and the Indian-hater. But the degree to which the characters reflect the varied ways whites dealt with the frontier and its Indian inhabitants suggests a greater degree of historical sensibility than we usually get from Hollywood. In any case, I recommend you see the movie for yourself. Will ‘Free State of Jones’ change any popular notions of the Civil War? The trailer for Free State of Jones is out. In case you haven’t seen it, here you go. It’ll be interesting to see if this movie has any effect on popular notions of the Civil War, the South, and the Confederacy. People have a tendency to equate the “Civil War South” with the Confederacy. Using “the South” as shorthand for “the Confederacy” in the context of the Civil War is something we all do from time to time, but it’s important to remind ourselves that the two weren’t synonymous. The Civil War divided Southerners just as it divided the nation as a whole. This wasn’t just true in the sense that some states in the South never seceded; it was also true of many people living within Confederate territory. For many Southerners faced with conscription, shortages, home guards, and requisitions of goods, the idea of rallying around the Confederate flag became more and more distasteful as the war dragged on. And, of course, some Southerners in Confederate-held territory were never crazy about secession to begin with, as was the case for many people here in East Tennessee. It’s also noteworthy to see a movie depicting blacks and whites engaged in anti-Confederate resistance. The point here is not to fashion some myth of interracial amity in the nineteenth-century South. The point, rather, is to consider black Southerners as Southerners—in other words, as real people with some degree of agency living in the South, rather than an inert mass simply awaiting the war’s outcome. In other words, when we speak of a divided Civil War South, it’s easy to forget that white Southerners weren’t the only potential source of anti-Confederate dissent within the region. I think a cinematic reminder of these Southern divisions in the Civil War would do us all some good, whatever region of the country we hail from. A lot of neo-Confederates equate critiques of the C.S.A. with attacks on the South as a whole. I can heartily agree with them that a lot of Americans carry unjustified and pernicious prejudices regarding this region, but remembering that “the Confederacy” and “the South” weren’t synonymous might help us all examine the C.S.A. a little more dispassionately. Conversely, folks from the North who let the darker aspects of the South’s history determine their attitudes toward the region and its people might rethink those attitudes after seeing Newt Knight’s story. Even in the 1860s, there were Southerners doing unexpected things. America’s favorite pseudohistorian now has his own show on the three-ring circus that is the Trinity Broadcasting Network. That’s a formula for comedy gold—not as much as all that gilding on TBN’s sets, perhaps, but still quite a bit. He’ll be in good company over there. TBN evidently has a thing for self-appointed experts with dubious credentials. One of their shows used to feature would-be creation scientist Carl Baugh, whose claims are so fatuous that even his fellow young Earth creationists have denounced him. Barton’s apparent immunity from criticism never ceases to amaze me. You’d think a guy who has been shown to be wrong as much as he has would eventually lose a little credibility. I suppose when the criticism is coming from “a few dedicated liberal individuals,” you can afford to shrug it off. In a few days, Disneyland is closing some attractions—most of them in Frontierland—to make way for construction of a new Star Wars themed area. 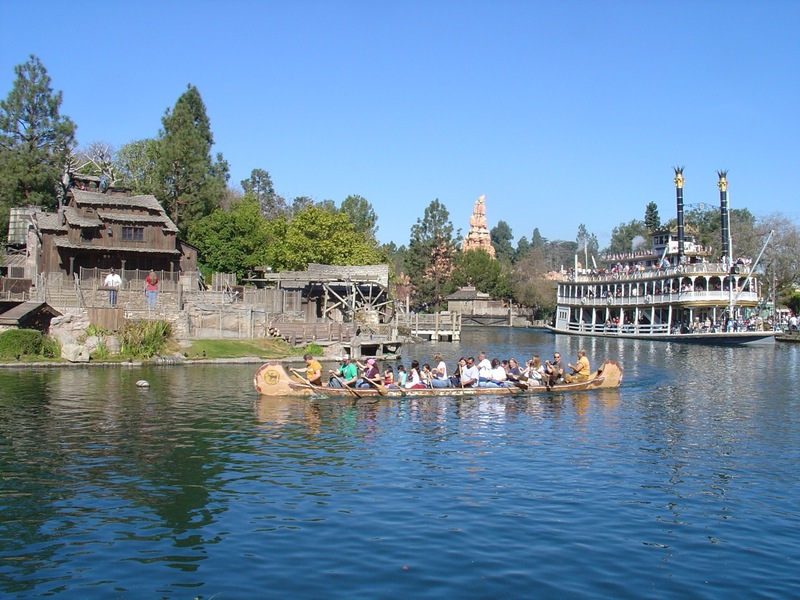 The Disneyland Railroad, Davy Crockett’s Explorer Canoes, Mark Twain Riverboat, Sailing Ship Columbia, and Tom Sawyer Island Pirates’ Lair will be out of commission for at least a year, while the Big Thunder Ranch Jamboree, Petting Farm, and a frontier-themed BBQ restaurant are shutting down for good. It’s somewhat fitting that Disney is replacing parts of Frontierland with Star Wars, because it reflects some long-term changes in the relationship between popular culture, childhood, and historical memory. For kids of my parents’ and grandparents’ generation, the American frontier was the setting for a lot of the mass media they consumed and the toys they played with, whether they were listening to cowboy-themed radio shows in the 1930s or watching the wildly popular Davy Crockett serial on the Disneyland TV series in the 1950s. The Crockett serial starring Fess Parker was so popular that it became a bona fide part of the Zeitgeist for children of the 1950s. According to the L.A. Times, at the height of Crockettmania, parents were buying 5,000 coonskin caps per day. The same article reports that Disney moved some $300 million in Crockett-themed merchandise before the whole thing ran its course. I ran that figure through some inflation calculators. Turns out $300 million in 1955 would be the equivalent of $2.6 billion in 2015. To put that in perspective, it’s more than the 2013 merchandising revenue from Spider-Man, the Avengers, Batman, and Superman combined. I can’t think of any historical-themed franchise aimed at kids from my generation or since that has had that kind of popularity. Sure, I had a few Western-style cap guns, pirate swords, and toy rifles when I was a kid. But the dominant media and toys of my childhood took fictional universes as their setting, not the frontier or some other historical era. Instead of Crockett and the Swamp Fox, we had He-Man and Han Solo. By the time my generation of kids came along, moviemakers and toy manufacturers had traded in the West for Eternia and Tatooine. Same thing goes for today’s kids, whose cultural touchstones are the fictionalized worlds of Star Wars, Harry Potter, and so on. I don’t intend this to come across as a “kids-these-days-don’t-know-their-history” rant. It’s not that children of the seventies, eighties, nineties, and 2000s were any more susceptible to mass marketing or any less susceptible to a fascination with the past. It’s just that the media and products aimed at kids have changed. There aren’t any historical TV shows that can command the kind of market share ABC’s Disneyland show had sixty years ago, when there were fewer channels and the whole country was watching the same programs. And despite the popularity of “historical” shows like the Crockett and Swamp Fox serials, I don’t think anybody would argue that they helped kids of the 1950s to develop any sort of historical sensibility. The people and events depicted in these old programs bear little in common with their historical counterparts. Indeed, Frontierland itself isn’t even a fictionalized depiction of any particular time or place. Instead, it’s an imaginative evocation of all the different Wests of our imaginations: the palisaded forts of Crockett’s trans-Appalachian frontier, the steamboats of Twain’s Mississippi, the saloons and dance halls frequented by cowboys and gunslingers, and the dusty mining towns of the Southwest. Still, exposure to a fictionalized past can help spark an interest in the real one. Perhaps a history-themed entertainment franchise with the sort of popularity enjoyed by Harry Potter or Star Wars would create a new generation of budding historians. As things stand now, though, I doubt that a major theme park built in the 2010s would devote an entire themed area to the frontier. An amusement park with a Frontierland made sense in the 1950s, but the West just doesn’t have the same hold on kids’ imaginations that it did in the days of Roy Rogers and Fess Parker. The past isn’t the mass-marketed playground it used to be. Today is the 239th anniversary of Washington’s victory at the Battle of Princeton. Unfortunately, it’s also a day in which Princeton Battlefield is under threat. Despite concerns from preservationists, historians, hydrologists, and now state lawmakers, the Institute for Advanced Study shows no signs of slowing down in its effort to build faculty housing at the site. Why not commemorate the battle’s anniversary by taking a few minutes of your time to help protect the place where it happened? Here are a few easy things you can do. Donate to the Princeton Battlefield Society. These folks have been at the forefront of the effort to keep the battleground intact. Contact the Institute for Advanced Study and let them know that you’re one of the many folks who oppose their construction project. Support the National Trust for Historic Preservation and its work on behalf of Princeton Battlefield and other special places. If you’re in the area, pay a visit to the site. Higher visitation makes it easier for people who care about historic sites to make a case to the powers that be that these places are worth protecting.